Family Volley: FAMILY FUN FRIDAY - Exploding Straws! FAMILY FUN FRIDAY - Exploding Straws! This weeks Family Fun Friday is a blast. Literally. Well, nothing really explodes, don't worry. All you need are straws. Just be sure you use the straight straws. You DON'T want the ones that bend. Cut each straw in half. Each person needs their own half straw. Have each person stand in a circle facing inward. Have them place one finger pointing out on each hand. One hand faces up holding a straw; the other hand is on top of another straw facing down so that each person is working with the people at his or her sides to hold two straws. The people cannot touch the sides of the straws. 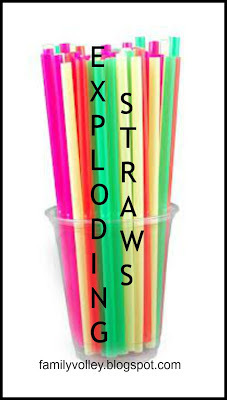 Just the tops and bottoms of the straws with the tip of one finger. Explain to your family that you are scientists that work in a lab. The lab stores nitroglycerin in test tubes (your straws.) While someone was walking through the lab, they tripped and all the test tubes went flying. You jumped to catch them (which is why they are in your hands now). You had to catch them this way because the sides are fragile and if you touch the sides, the tubes will break and explode. It is great that you caught the tubes, but you can't actually put them down until you have all turned outward. As a group, you need to turn around so you end up facing outward. You need to do this without dropping the straws or touching the sides of the straws. Otherwise, the test tubes explode and you have to start all over again. This means that the entire circle needs to stay connected to one another with their straws. While they are turning around. This game is a blast, and a fun way to teach your family to work together, communicate, and learn to be a team player. Need even more challenge? Blindfold one of your family members. You can also make everyone play without talking. Have a great weekend. 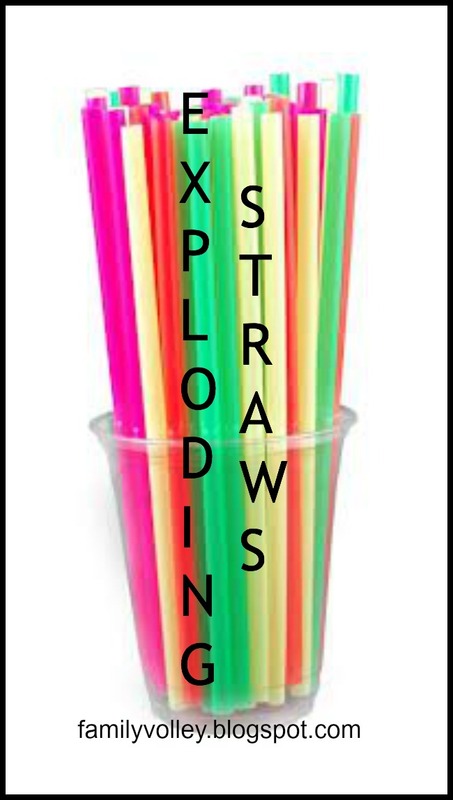 Take a few minutes and play exploding straws with your family and friends.